Are you in serious need of a locker room or warehouse renovation? It may be more affordable than you think. With the various locker options available at Shelving Direct, you can create locker room, change room and warehouse solutions designed specifically for your needs. They are available in three different depths (12”, 15” or 18'' deep) and their 2 doors, offer maximum flexibility. The reliable kick-proof lift handles and proven latching system on our locker cabinets ensure maximum security. Lockers feature rugged, heavy gauge steel doors mounted in welded frame assemblies for strength and durability designed to last. 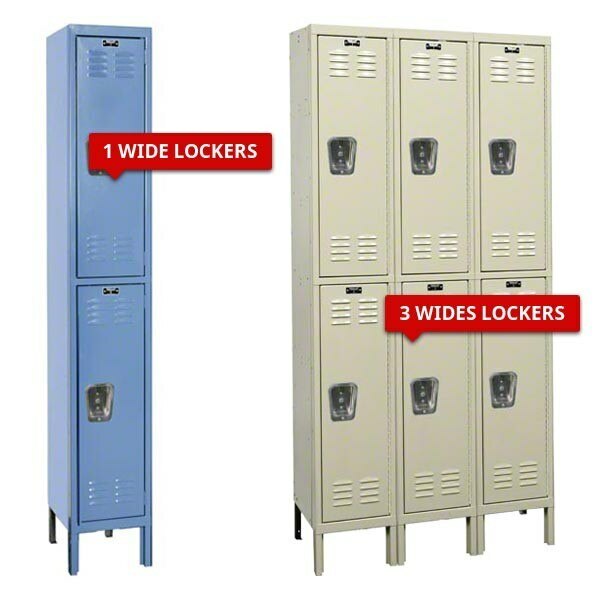 Lockers are available in three colors for immediate delivery: blue, gray and parchment. Our top quality US manufactured lockers come in a variety of sizes to help you customize your space efficiently. Metal lockers are assembled so you do not need to waste your time assembling them.